Every once in awhile when I cook, I accidentally mix unique flavor combinations that become a family favorite. Sometimes I’m really not even sure how it happened. Well, I know how it happens, but often, it stems from cleaning out the fridge or using up miscellaneous items. Does that happen to any of you? I realize that an Easy Elegant Chicken recipe shouldn’t come about by accident, and you may tend to second guess me, but don’t. Even my one picky eater, who typically wants basic ingredients, has requested it again. Honestly, with just four main ingredients, it’s amazing how this packs such a flavorful punch, but it’s rolling the chicken in cashews (or you could even use pecans) that takes it from good to gourmet. I have already used apricot preserves in my popular Chinese Orange Chicken recipe so I knew how delicious of an option it was. I just elevated the flavors a bit. While I have listed apricot preserves, I actually only had a half of a bottle, but also had fig preserves that I bought from the farmers market, so I mixed those two together. In a pinch, you could probably mix pineapple too, but apricot is my favorite. This picture doesn’t do it justice. I’m going to share up front that my guys gobbled this up so quickly that I didn’t get a finished picture. This is a tiny piece that I hid in the back of the fridge, forgot about it and ended up snapping a picture the next day. Straight out of the oven, the cashews are nicely baked and crunchy. I know that serving it with what looks like coleslaw is an odd combo, but the blend of tangy and sweet were wonderful. Since our Southern BBQ is always served with a vinegar based coleslaw on sandwiches, I thought this might be good as well and I was right. It was so yummy. I hope you enjoy this new twist on typical chicken. 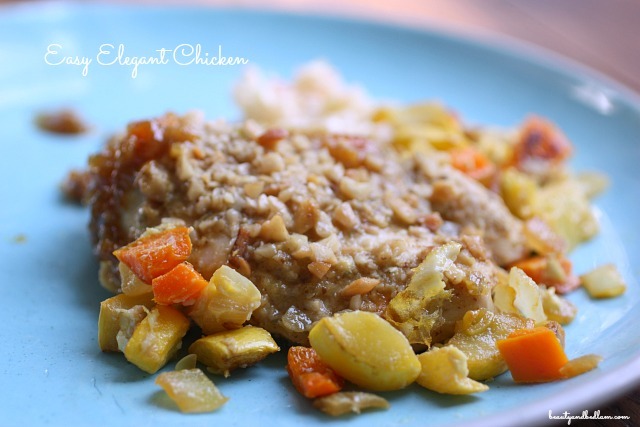 We sure loved it and the ease of preparation makes this a new favorite in the dinner rotation. 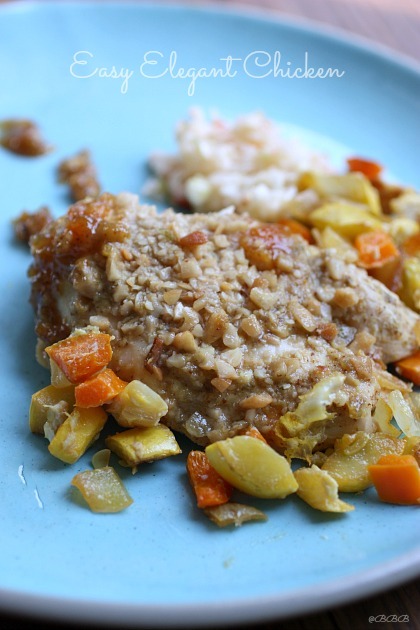 Summary: Rolled in cashews, this easy chicken recipe goes from good to gourmet in minutes. In a small saucepan, combine preserves, mustard and seasonings. Cook over low heat until preserves have melted. 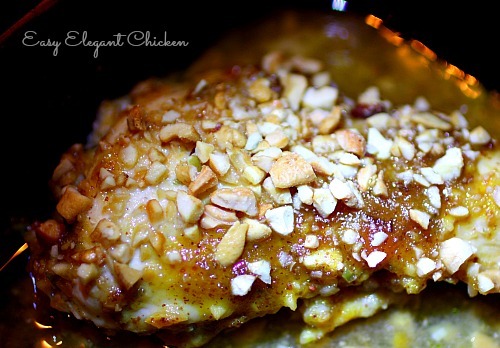 Dip chicken in apricot mixture, then roll in cashews. 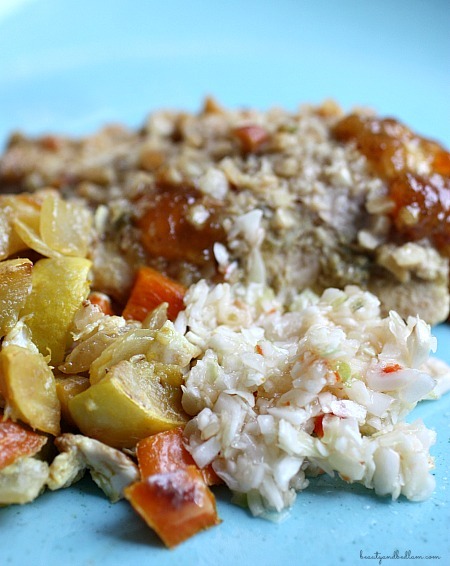 Place chicken in greased 9×13 pan. Bake for 15-20 minutes or until chicken is done. Bring remaining sauce to boil and serve sauce with chicken.